Been traveling half around the country (Netherlands so not that far) to get two new baby's. I traded my dean zalinsky stratocaster and as he really liked my JTR design samick Telecaster i traded that one too. 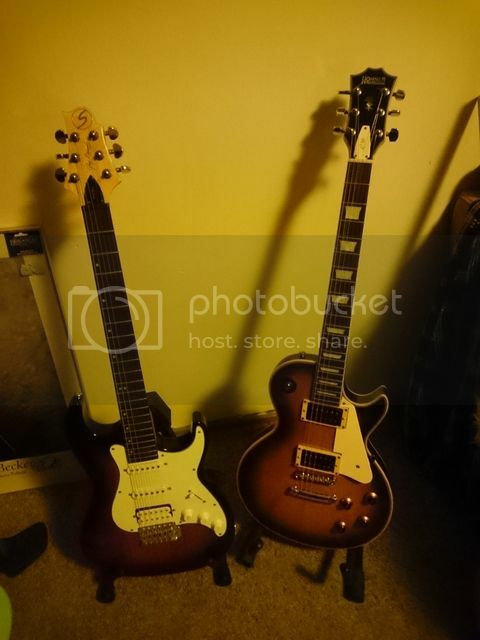 So a new les Paul joined the family and a samick stratocaster sneaked in as well. No doubt hefty. Interesting specs they used on those Hohners according to the literature. California solid maple body. Flame maple veneer on top, ash on back. Mahogany neck. Indian Rosewood fingerboard. That about covers all the tone woods I’d say! Haha Yes but it is a really nice player guitar. Here is a picture of the back. Pickups are not original bridge is a JB, neck '57. Pickguard is not original either and I probably will just remove it. Or anyone know how to match color and size? Bridge was changed too. Do have the original parts, not .pickguard. The malibu2 is nice too lovely vintage sunburst. Today i thought to work a little on the stinky hohner. Previous owner was a smoker so needed to get the smell off. Broke the high e so it was cleaning feeding and new set of strings for this guy. Well bridge pickup is a seymour Duncan '59, neck Gibson '57 classic. It has what looks like a laminated top and the. Body is solid Mahogany as far as i can see, several parts. Back looks to be a 2-3 mm thick one piece Mahogany (i think). Neck is also made out of a few pieces. But it plays really good with low action and I love the neck. Pickguard is off....any way to date these? There is a number on the back cover. Nineties just as i thought. Cream pokeechip looks way better. Guess I will change the one on mine. Looks good with those zebra pickups. Anyone know how they sound. Not that I would change them back. Pickguard looks so off color also on those pictured there. Same weird headstock seam. Top is also not Carved, noticed that too. Just wondering how they made it sound and play good building it that way haha. They dont even have adjustable pole pieces on those Zebra ones, so just generic import humbuckers. There are a bunch of Hohner videos of your guitar on youtube to find out. The top is ply bent rather than carved. So there id a small gap. Other than that it is solid wood Mahogany looking wood. Several pieces, 3 at least, might be more. On the back is a 2 to 3 mm one piece part making it look one piece... So looking at all this i guess I normaly would pass. Glad i did not. I really like it. Anyway should have taken pictures when I took pickups out to show the build. Not planning on putting the original pu back in, the look and feel cheap. Just like the zebra look. The pickups in are the ones i was curious about. 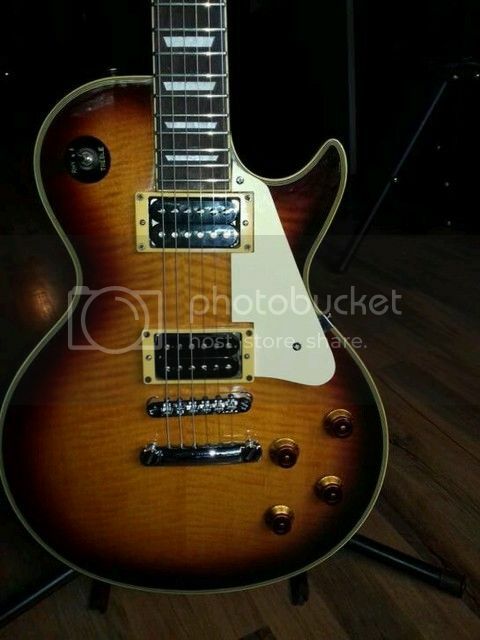 Do not know the age of the seymour Duncan but the gibson is a 2009 one. Have a weak for anything old....(well not everything old....but that is something else) pots are alpha and they do the job. Looks way better now with pickguard off, now to find a matching pokeechip .